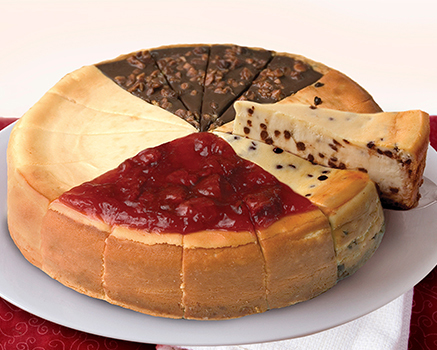 Wow your guests with an assortment of Eli's desserts. Includes one 9" Strawberry Cheesecake, 12 mini pies (6 Apple and 6 Cherry), and 12 brownie bites. INGREDIENTS: Cream Cheese (Pasteurized Milk and Cream, Cheese Culture, Salt, Carob Bean Gum, Guar Gum), Sugar, Strawberries, Sour Cream (Cultured Nonfat Milk and Cream, Corn Starch, Whey, Guar Gum, Carrageenan, Carob Bean Gum, Enzymes), Wheat Flour, Egg, Butter (Cream, Salt), Water, Modified Corn Starch, Powdered Sugar (Sugar, Corn Starch), Vanilla Extract, Egg Whites, Salt, Pectin (Pectin, Dextrose), Natural Strawberry Flavor, Citric Acid, Natural Color (Vegetable Juice), Soybean Oil, Soy Lecithin. INGREDIENTS: Apples, Wheat Flour, Butter (Cream, Salt), Sugar, Dark Brown Sugar [Cane Sugar, Molasses, Cane Invert Sugar (Sucrose, Water)], Fructose, Corn Starch, Water, Sugar Yolk (Egg Yolk, Sugar), Sanding Sugar (Sugar, Carnauba Wax), Egg Whites, Modified Corn Starch, Nonfat Milk, Tapioca Dextrin, Ground Cinnamon, Salt, Soybean Oil, Soy Lecithin.